Home / Shipping News / International Shipping News / 10 Years On From Lehman, How Is Shipping’s “Hangover”? 10 Years On From Lehman, How Is Shipping’s “Hangover”? On 15th September 2008, the collapse of Lehman Brothers crystallised the financial crisis and the onset the worst economic downturn for a century. 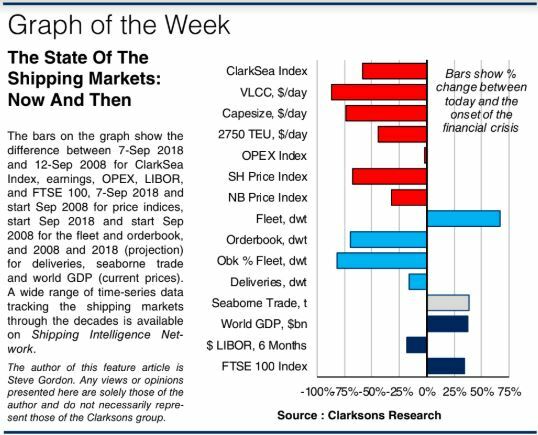 To a shipping industry used to extreme cycles but transitioning to recession with rapid trade collapse and a huge newbuilding orderbook the initial shock was severe and the “hangover” prolonged. This week’s Analysis compares the situation almost ten years to the day. Bye Bye Boom… Even for an industry well used to severe cycles (and with warning signals if you looked hard enough), after five years of freight rates sustained at levels not seen for a century, the transition to recession after Lehman was dramatic. The most catastrophic collapse was in Capesize. From surging to a frenzied $300,000/day in June 2008 (fanned by a $180/t iron ore price, stockpiling and congestion) earnings collapsed to $6,000/day in October and $2,000/day in November. Initially the tanker market was more stable, helped by single hull conversion and trader storage, while the container market saw 12% of the fleet laid up by late-2009. Not The 80s Revisited? As our graph shows, unsurprisingly rates and prices today sit well below the week preceding Lehman. But although the shipping recession has felt prolonged, it’s been far from a “dead” decade with surprising upside at times. Even in 2009, Capesize earnings rose to $70,000/day as China’s steel output yo-yoed. There were also spikes in LNG (2012), LPG (2014-5), tankers (2015) and offshore (2013-14); and heavy (over!) newbuild ordering (2010, 2013) and record years for S&P (2017), so plenty of business has been done, helped by low interest rates. Arguably the container sector has had the most pain (but it’s a close call, and spare a thought for the bankers?). 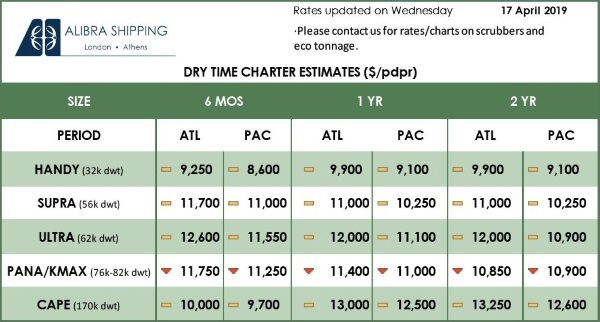 Although shipyard output has dropped by 16% over the ten years (to 80m dwt), that’s far from the whole story! Having built up a record backlog (c.650m dwt, a daunting 55% of the fleet) and at prices that “on paper” were very profitable, the unravelling of the financial and contractual complexities became an appallingly complex task (especially with 30% of the capacity involved “greenfield”, and financial structures such as the KG). With analysts tracking cancellation and slippage closely, shipyard production eventually peaked in 2011 (the fastest output growth in peace time). 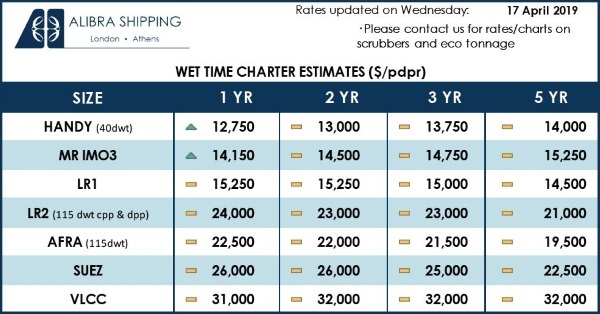 At times fleet growth has felt relentless (peaking at 9% in 2011, a more helpful 2.6% in 2018) as shipbuilding has worked through its overcapacity. Although demolition has doubled in the ten years since, the world fleet is still a staggering 67% larger today (1.96m dwt!) than at the onset of the financial crisis. The immediate sea trade deterioration was severe, with volumes declining for only the second time in 30 years in 2009 (by 4%, with oil down 3%, dry bulk down 3% and containers down 9%). Trends since have been more encouraging, with a 38% increase (exactly the same % as GDP growth) to 12.0bn tonnes (big winners include dry bulk (+1.7bt), supported by a series of Chinese fiscal stimulus and infrastructure investments). After a “tough” ten years, that’s a more positive note to end on! Have a better decade!